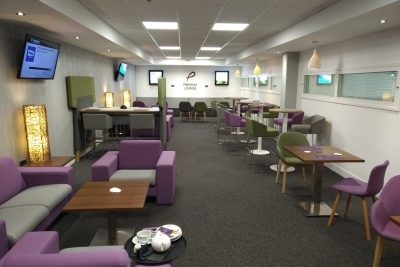 This is our review of the Premium Lounge at Doncaster Sheffield Airport. We are building our collection of UK airport lounges reviews. There are, however, still a few lounges that neither Rob nor I have visited and where we are happy to run contributions from readers. Because, let’s be realistic, we’re not going to be at Humberside Airport in the near future. 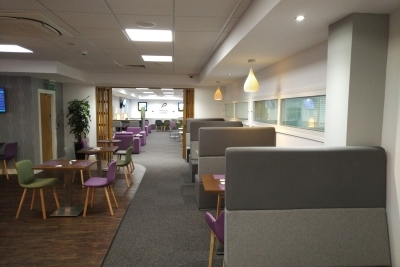 Today we’re reviewing the Premium Lounge at Doncaster Sheffield Airport. Reader Kamil sent us some pictures and notes after his recent flight to Warsaw. You can find all of our other UK airport lounge reviews here. Kamil had a flight to Warsaw at 8am on a Friday and visited the Premium Lounge at 7am. During the Summer season (1st April to 31st October) it is open from 5am to 6.30pm daily. 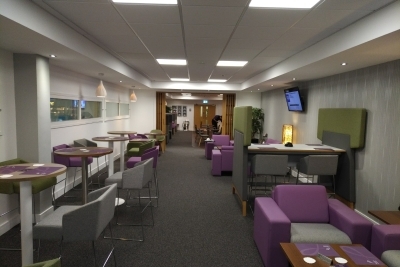 The lounge is located on the first floor in the departure lounge opposite the gates. You can see the planes taxiing and taking off and keep an eye on when boarding starts and how many people are left in the queue. The lounge was very quiet with no one else around. From the register he could see that only seven people had been in the lounge earlier that morning. The receptionist scanned Kamil’s Priority Pass and showed him around. There were three washrooms within the lounge (male, female, disabled/baby changing room), several seating areas and wifi was complimentary. 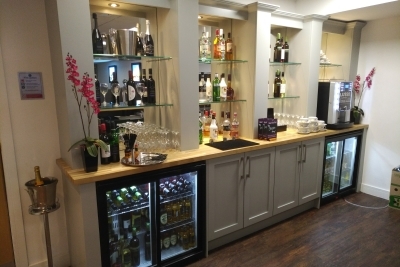 There was a good choice of alcoholic beverages with several beers, ciders, wines and mixers which were self served. There was also a coffee machine in the bar area. As it was 7am, the lounge was serving breakfast. Available were the usual muesli, cereals, pastries and bread as well as scrambled eggs and bacon. The staff were happy to prepare a fresh portion of scrambled eggs for Kamil. 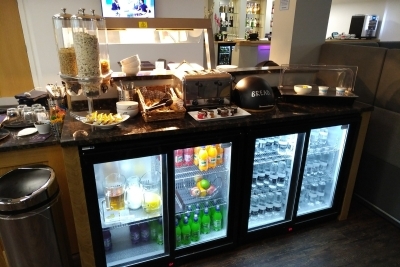 Kamil enjoyed the Premium Lounge at Doncaster Airport and recommends it to anyone who would like to do some work before a flight. As the lounge seems to be very quiet in the morning and they serve a decent breakfast, he felt it was also a good place to just relax and grab some food. 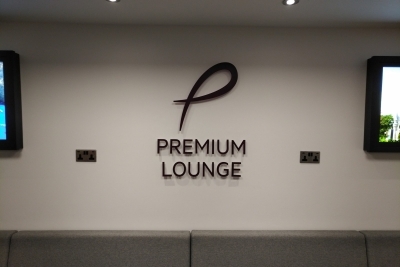 You get into the Premium Lounge at Doncaster Sheffield Airport by using a Priority Pass, which comes with an American Express Platinum card (or you can buy one) and allows unlimited free lounge visits, or HSBC Premier’s LoungeKey card. It does NOT accept Lounge Club which comes with American Express Gold (two free visits per year). You can also pay cash on the door, or pre-book a spot via the Lounge Pass website. Appreciate the review, looks a bit enclosed, no photos of views of the runway? If you look through the windows to the right of the pictures it looks down to the main departure waiting area and rather good weatherspoons then onto departure gates and then onto runway view. To say the lounge has a runway view is a bit of stretch. You probably can see it but it’s about 100 yards to the main departure gate windows which have a runway view. Thanks for the review, well timed for me as I will be passing through on Tuesday. Finally my local airport I wanted to cover this lounge first! Rob are you sure lounge club is accepted? I’ve checked again and it’s not listed on their UK lounge list plus I don’t know anyone successful in using it to get in. If it’s that’s very annoying as I’ve always sat there and looked up from departures annoyed yet again loungeclub isn’t accepted! Anika wrote the article not Rob. Was my fault actually. HFP is a bit like a TV drama where the name on the episode credits does not reflect everyone who contributed! This is especially true on the Bits articles these days. I added that in without checking if I am totally honest. It seems I was wrong 🙂 Edited, and thanks. Anyone else notice what looks like a bottle of Veuve Clicquot in the free standing ice bucket on the far left of the 5th picture down? Quite something for a third party lounge! I’m happy to review the Jersey BA lounge I’m based there so in and out most weeks. I can highly recommend the fish finger sandwich if it’s on the menu. Also, when passing through for an anniversary trip to Paris, one of the staff pottered off and bought us a card. Can’t see that happening at LHR!